Which is exactly right. Why was the government asking a bank to wait for due diligence when they'd already given it a full guarantee? The due diligence is done by the entity before putting the big money on the table, which they already had in September. Unless ... they hadn't! UPDATE: Much of the initial commentary on this tape focuses on a supposed threat by Drumm to punch Brian Lenihan, then Minister of Finance. It's clear that Drumm meant it metaphorically as a demand to Lenihan to clarify whether or not Anglo was considered systemic by the government. Incidentally, Lenihan was not diagnosed with cancer till a year after this conversation, contrary to some tweets related to the topic this evening. When you've guaranteed somebody's entire liabilities, it's smart to write a very small cheque to stop them being called. Note: here's a transcript of the full conversation involving both clips above. THE brilliant English economist John Stuart Mill, writing in the 1860s, noted that "a crash doesn't destroy wealth, it merely reflects the extent to which wealth has already been destroyed by stupid investments made during the preceding boom". But that's not the only problem. That quote is not from John Stuart Mill, though various websites (from where McWilliams probably took his notes) say that it is. It was by John Mills, Article read before the Manchester Statistical Society, December 11, 1867, on Credit Cycles and the Origin of Commercial Panics, which is an important article in the intellectual ancestry of Austrian economics. Luckily, Ireland's actual policy decisions around the time of its banking crisis were characterized by much greater diligence. UPDATE 27 SEPTEMBER: McWilliams uses the botched quote again. The European Union Council of finance ministers was popping the Champagne last night as they reached agreement to implement a 2008 decision to beef up their authorities to wind up busted banks. In theory the deal creates large room for bail-in i.e. support from existing creditors before taxpayers have to pick up the tab. But the various thresholds which the deal imposes for these bail-ins to apply are small, and riddled with exceptions e.g. Certain types of liabilities would be permanently excluded from bail-in: – covered deposits; – secured liabilities including covered bonds; – liabilities to employees of failing institutions, such as fixed salary and pension benefits; – commercial claims relating to goods and services critical for the daily functioning of the institution; – liabilities arising from a participation in payment systems which have a remaining maturity of less than seven days; – inter-bank liabilities with an original maturity of less than seven days. This invites the EU's next Anglo Irish to (1) go deep, load up on such dodgy loans that you'll quickly bust through any bail-in thresholds, (2) pay your reckless managers large salaries and pensions, which are protected from bail-in, and (3) finance yourself as much possible through the payments system, especially when things are about to go pear-shaped., because payment system transactions and short-term liabilities are also protected from bail-in. At some point, we're at the "it's not a bug, it's a feature" conclusion. Second, the arrangements for bail-in could be more rules-based. The ECB has always argued for discretionary exclusions from bail-in to be limited so as to make the rules of the game clear for global investors. The Council approach gives the resolution authority powers to discretionarily exclude any type of liability for reasons of impossibility within a certain time frame, or to avoid wide-spread contagion. In our view, there would have been a benefit in defining ex ante the categories of liabilities that could have been excluded. This means that investors will lack certainty about how the new framework will be used, and in my view it may slow down the process of reducing financial fragmentation. For instance, there will inevitably be a political economy dimension to how national resolution authorities decide to exercise their discretion, with creditor classes that have particular importance in different national contexts likely to be favoured. This will affect the level-playing field between Member States. Moreover, the BRRD foresees that after 8% of a bank’s liabilities have been bailed-in, the national resolution authority has the option to use its resolution fund to bail-out a further 5% of the bank’s liabilities. However, some countries will have larger resolution funds than others, for instance if they have more banks paying into the fund. This means that these countries would be able to bail-out more domestic banks before they exhaust the fund than those with less resolution resources available, who would need to use more bail-in. This will also not help reduce fragmentation. He [Bowe] also says: "If they (Central Bank) saw the enormity of it up front, they might decide they have a choice. You know what I mean? "They might say the cost to the taxpayer is too high . . . if it doesn't look too big at the outset . . . if it looks big, big enough to be important, but not too big that it kind of spoils everything, then, then I think you have a chance. So I think it can creep up." Mr Fitzgerald, the Director of Retail Banking, is heard saying: "Yeah. They've got skin in the game and that is the key." Rule 5: Decision makers must have skin in the game. At no time in the history of humankind have more positions of power been assigned to people who don't take personal risks. But the idea of incentive in capitalism demands some comparable form of disincentive. In the business world, the solution is simple: Bonuses that go to managers whose firms subsequently fail should be clawed back, and there should be additional financial penalties for those who hide risks under the rug. This has an excellent precedent in the practices of the ancients. The Romans forced engineers to sleep under a bridge once it was completed. The problem is that "skin in the game" logic quickly leads to the sunk cost fallacy -- we've already put in money, so we have to put in more -- and that's what Anglo banked on in its dealings with the Irish government. “These people view their ascension as the exclusive product of their own hard work. They are not conscious it is the fruit of policies taken by the government as well,” says Rui Falcão, president of the PT (governing Workers Party). Nevertheless, the ECB notes that neutralised euro banknotes retain their legal tender status and that this has been acknowledged by the European Commission. In this respect, the requirements and prohibitions introduced in the draft law by the amendments would affect the legal tender status of presumably neutralised banknotes. In addition, they would effectively introduce limitations on cash payments in relation to the settlement of cash transactions where such euro banknotes are used in good faith to this end. Recital 19 of Council Regulation (EC) No 974/98 of 3 May 1998 on the introduction of the euro 12 states that limitations on payments in notes and coins, established by Member States for public reasons, are not incompatible with the status of legal tender of euro banknotes and coins, provided that other lawful means for the settlement of monetary debts are available. The ECB acknowledges that: (a) such other lawful means for the settlement of monetary debts, other than neutralised euro banknotes, are available in Belgium; and (b) the draft law’s objective of enhancing public security by reducing the risk of criminals’ being able to put into circulation neutralised euro banknotes in relation to a crime qualifies as a public reason outweighing the impact of the limitations on cash payments. One strange thing is that while the ECB legal department bends over backwards to ensure that cash that might have been involved in a robbery remains legal tender in Belgium, Cyprus still has significant currency controls -- technically on the banking system rather than on cash, but in a modern economy, you can't have one without the other. Given the ECB's logic in the Belgium case, does this mean that it would be harder for Cyprus to bring in restrictions on the use of dodgy-looking euro cash since alternative forms of payment are more difficult? Judging from the e-mail traffic around here, it looks like Ireland has found a new business line from being a preferred offshore location for structured investment vehicles of the global banking system, an activity that blew up in 2007. Now we seem to be a preferred offshore site for spam. Litigation being what it is in Ireland -- what did the EU expect when taking on the country's most powerful lobby? -- we won't name names, but a recent spam surge began with an outfit nominally complying with US law by giving a physical address on Baggot Street in Dublin. 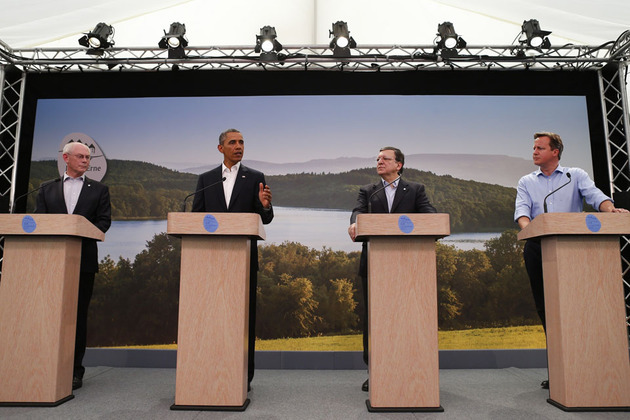 Did the UK really bring the G8 leaders to Lough Erne just to have a fake backdrop at the news conferences? A Free Syrian Army fighter wears a stylish Titleist cap as the group waits for the next go-round in Aleppo with Bashar al-Assad's Russian-equipped and Hezbollah-augmented forces. Photo: Reuters stringer, although the same photo appears in the New York Times print version only of this story, credited to Hamid Khatib. 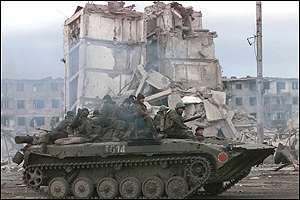 This is a Russian tank patrolling Grozny, Chechnya, in the year 2000, after the Russians were done demolishing the city with artillery and rockets to force Chechen rebels out of it. Bashar al-Assad -- with Russian-trained military advisers and Russian military equipment -- has done the same thing on a small scale in Qusayr last week and is intending to the same thing to Aleppo, a rather large city. He'll probably do it in July, when the world's foreign policy elites are en vacances and the best we can hope for is a statement of condemnation tapped out on someone's Blackberry. Don't we say Never Again after each one of these things? Heckuva job. Speaking in Essex on Monday ahead of next week's G-8 summit in Belfast, British Prime Minister David Cameron .. The G-8 summit is not in Belfast. It's at the Lough Erne resort in County Fermanagh, which is about 90 miles from Belfast. You'd think a party that is so focused on the intrinsic brilliance of the UK would have respect for such distinctions. Unless they're not sure whether Northern Ireland is in the UK. G-8 summitteers, welcome to Ireland. The Wall Street Journal has been doing good reporting on the not-so-paradoxical Washington DC property market, the one that kept booming even as other markets slumped. The reason: government spending on consultants and contractors, which has fed private fortunes in the defence and intelligence businesses. Now with the Prism/Edward Snowden revelations, the government is finding out that the supposed efficiency of contracting doesn't even bring information security, whatever its (dubious) financial benefits. Also, we've been saying it for about 9 years, but there's already a word out there for the people on the government side of these transactions: Securocrats. Only in Ireland have the troika’s policies, anchored in budget cuts and tax increases, shown much sign of working. 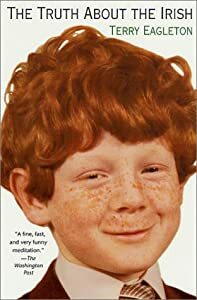 Image: Amazon page for Terry Eagleton's The Truth About the Irish. The Grand Mufti of the Kingdom of Saudi Arabia Sheikh Abdulaziz Al Al-Sheikh, who is also President of the Council of Senior Scholars, Scholarly Research and Ifta; Sheikh Saleh bin Abdulaziz Al Al-Sheikh, the Minister of Islamic Affairs, Endowments, Call and Guidance; and Dr. Mohammed bin Abdulkarim Al-Essa, the Minister of Justice, thanked Sheikh Dr. Yusuf Al-Qaradawi, President of the World Union of Muslim Scholars, who is based in Egypt, on his speech recently regarding the flagrant aggression against the Syrian people by Hezbollah of Lebanon in cooperation with the Syrian regime. They also hailed the position of Qaradawi in support of the Kingdom of Saudi Arabia's senior scholars, which was clear regarding this sectarian party since its inception. Qaradawi said he was earlier at odds with Saudi scholars on their views towards Hezbollah. 'Now I realized, they were right and I am wrong', he was quoted as saying. Reuters: Egypt this month announced a $12 billion bond programme that will include sukuk issuance in early 2014, which would be Irish-listed and governed under English law. Ms. Pacal said she and her friends believed that secular Turks were prejudiced against the pious. “What I can’t stand is people who are against us for our religion,” she said. That's a fake shopfront behind this man and his dog in Belcoo, County Fermanagh -- near where, not by coincidence, the G8 summit will be held later this month. Great* story with photography by Cathal McNaughtan for Reuters. UPDATE: A widely circulated Calculated Risk post based on an earlier Irish Times story about the same phenomenon appears to convey that Fermanagh is in the Republic. *The Irish Times probably should have gotten a credit from Reuters. The culture clash in NYC over bikes is pretty amusing, though I really don't get why they drive some people so insane. More than that, I really don't understand longtime New Yorkers (and I mean people in the dense transit and taxi rich bits, mostly Manhattan and parts of Brooklyn), choose to have personal car-centric lives. One difference between those dense bits of Manhattan and Brooklyn relative to the corresponding parts of Paris and London -- from which the bike rental idea was imported -- is that way more actual city residents are in those places, whereas they've been priced out in the European metropolises. Thus the routines of daily life in a congested city -- needing to get to 5 different places to complete what would be a single errand in the suburbs -- have a lot more weight in how people think about transport in New York. And rental bikes don't help a lot with that, so the locals are not going to be especially excited about them. Makhlouf initially petitioned Cyprus for citizenship in 2009, Phileleftheros reported. His supporting documents included real estate valued at 320,000 euros on the island, and 17.3 million euros in fixed five-year time deposits in Cypriot banks, it said. Assuming the money was still there recently, that means he took a big hit from the 40 percent haircut on bank deposits in the Cyprus bailout.